Non-biodegradable and fully or partially bio-based (e.g., bio-based PET, bio-based PE, Terratek® SC or Terratek® WC). Biodegradable and petroleum-based (g., PCL). 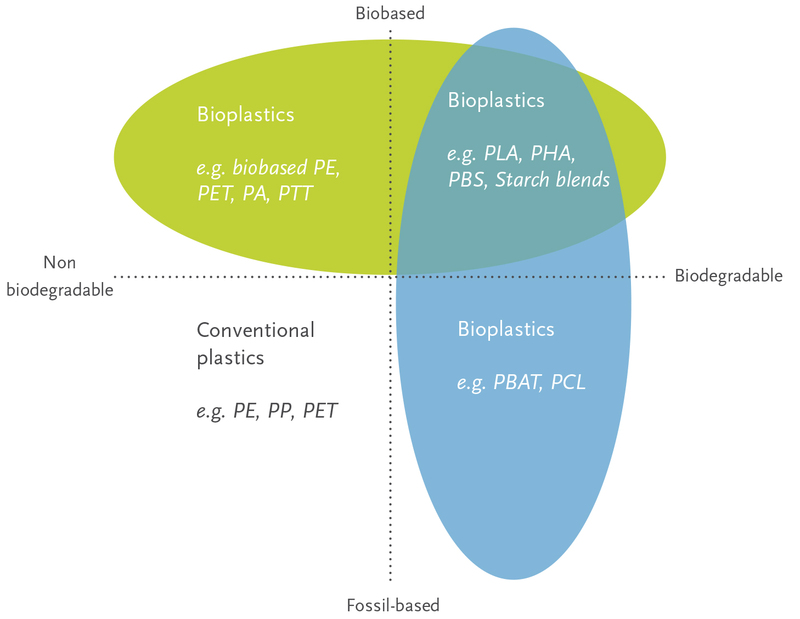 Both biodegradable and fully or partially bio-based (e.g., PLA or starch blends such as Terratek® BD). At Green Dot, we specialize in alloying biodegradable polymers to meet customer-specific part performance requirements. And we always aim to be direct and transparent when it comes to our bioplastic material options. It’s why, whenever we claim a material is “biodegradable,” we are referring to the compostability standards set forth in ASTM D6400 and EN 13432. That way, everyone is on the same page. To learn more, check out our guide to creating sustainable plastics without sacrificing quality or cost. You’ll learn how to meet your sustainability —and performance— requirements simultaneously.